We've got questions, you've got answers! ...is on the Leader Board? ...is the Hint of the Week? ...is "We Don't Know Either"? ...is the Tournament of Champions? 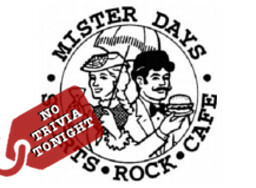 Due to some basketball games, there will be no trivia tonight (3.22) at Mister Days. Go sports and we'll see you next week! District Trivia is your neighborhood pub trivia done right. The best hosts, the best format and the best prizes combine to give the people of the Washington, DC Metro area the best trivia experience anywhere in the city. Take note: we thrive on creating organized chaos and our main goal is to entertain the crowd. We know that some people take trivia very seriously, we are not those people. Support Make-A-Wish & Win Bonus Prizes!